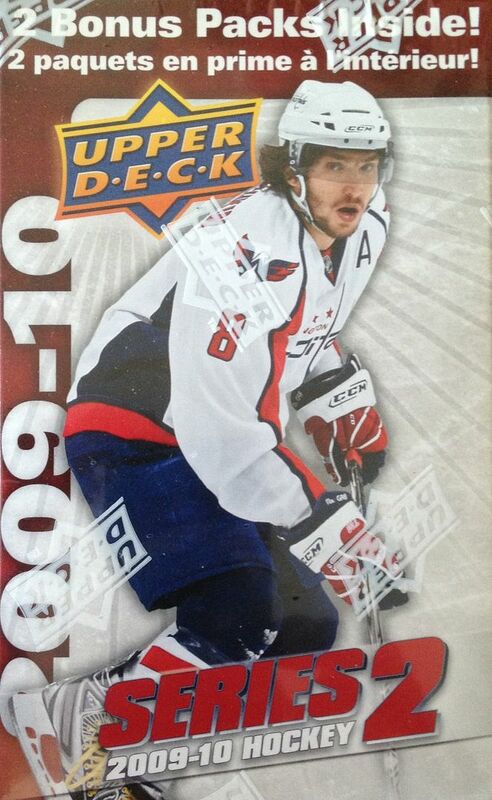 This week I'll be opening up another Upper Deck product... 09/10 UD Series 2!!! As usual I'll be looking for a couple of Young Gun rookie cards and whatever inserts decide to pop out. This will be the first of three of these 09/10 UD2 blasters as I was able to pick up a 3 box lot for just under $22 - not a bad deal for a chance at some nice rookie cards from the 2009/10 hockey season! When Upper Deck Series 1 and 2 come out, usually one of the pair is considered better than the other. This is because one of the series usually ends up with the better Young Gun selection. Last week, when opening up 08/09 Upper Deck, I was really only looking for Steven Stamkos. And he could only be found in Series 1. Series 2 of that year was markedly less desirable with hardly a desirable Young Gun to pull. 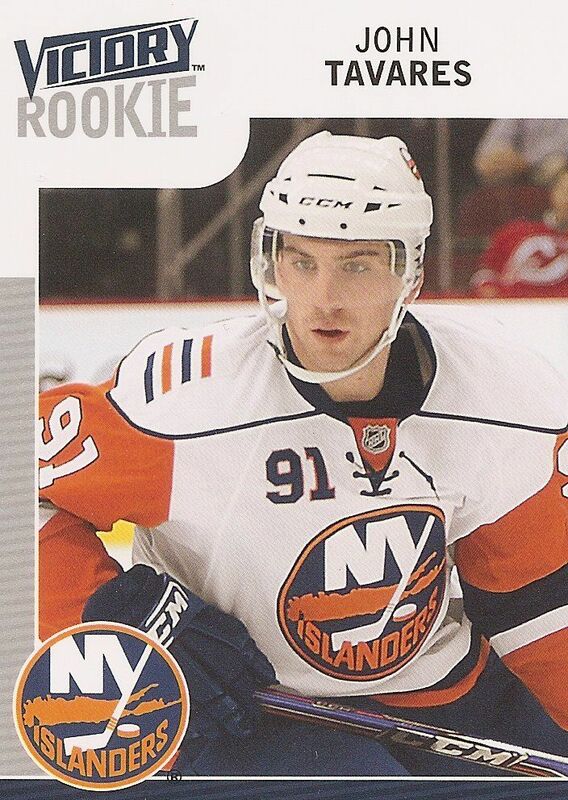 In 09/10, I would have to say that Series 1 was again the more popular series as it had John Tavares and Matt Duchene. Series 2, in my opinion, didn't drop off too far in terms of rookie quality though. 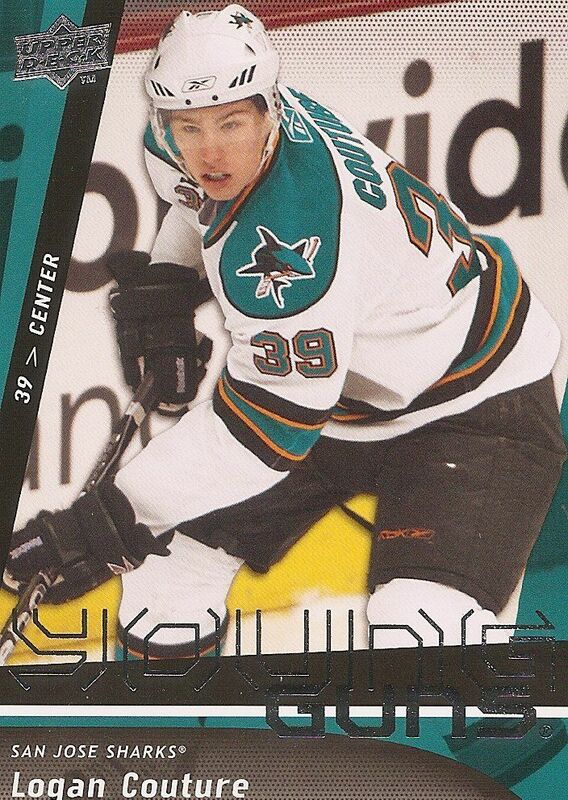 My favorite player, Logan Couture, can be found here. And a player that didn't hobby interest at all that year, but became hot later - James Reimer - can also be found in 09/10 Series 2. I was very impressed with this blaster of 09/10 UD2. Right off the bat a Young Gun was pulled out. It wast Tom Pyatt. He isn't a huge name to get, but it's still a Young Gun pull. There would be one more to find in this blaster. This blaster contained a large amount Victory Update cards. I actually completely forgot that Victory was inserted into this set. I was able to pull a smattering of Victory base and rookie cards - including a gold rookie parallel of Colin Wilson. The Victory rookie cards are ugly to me - they just look cheap and have an inelegant design. The Victory base, on the other hand, are actually very nice cards. This is one case where I wish the rookie cards looked exactly like the base with perhaps a rookie logo to indicate the player's first year. Speaking of base cards, opening this blaster reminded me that though I love the Young Gun design, I didn't particularly care for the base cards that year. To me the design was just too plain. The base cards looked like something from an uninspired 90's set. Well, not that terrible - but 09/10 is surrounded by better UD Series 1/2 designs in the years before and after. 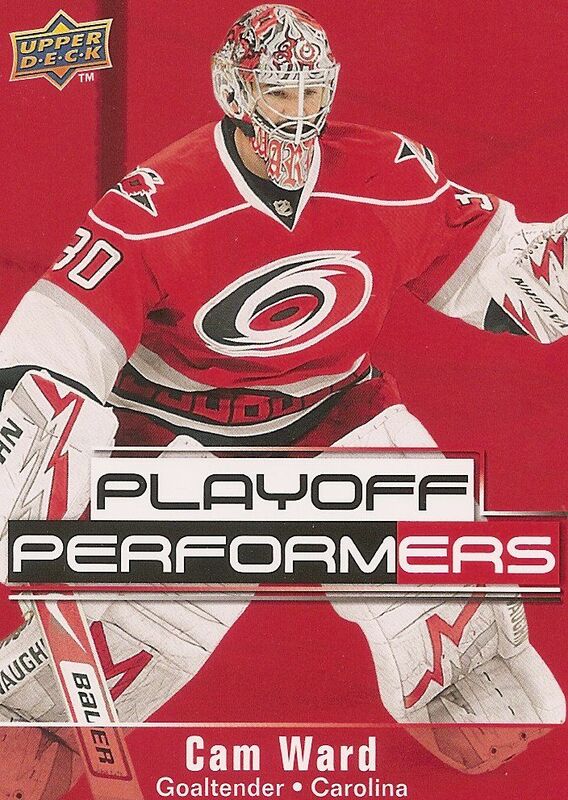 This third spot was a toss up between an Evander Kane Victory rookie and this Cam Ward insert. I chose Ward because of the way this card looks. It's such a bold looking card! I love the bright red background along with the large player photo. In the long run, the Kane could eventually be a more valuable card, but this one wins for its design elements. Also, I didn't want to have two Victory rookie cards in the top three. Though I have already stated that I didn't like the Victory rookies, this one had to be here. John Tavares is a supremely gifted hockey player. Though his team just lost in the first round of the playoffs, he was able to put his talents on display during the series. Tavares was the biggest name in 09/10 and I never felt like I pulled enough of his cards. It's always good to get a Johnny T rookie in my opinion. At a price of three for $21.95, these blaster boxes are a total steal! It's practically buy one get two for free. 09/10 Series two blasters contain some pretty solid Young Guns... and those are supplemented with Victory rookies. There are ample opportunities to pick up some sweet cards at a very reasonable price here. I definitely recommend this product. Get some and have some fun with it! Let me know what you thought of my 09/10 Upper Deck Series 2 blaster in the comment section below. Have you ever pulled anything great out of one of these? I'd love to hear about it. Where did you managed to get 3 for 21.95? That is an amazing deal as most LCS charge $10 or $12 a box. While I am here I must say nice pulls for a blaster you made your money back and then some on the Couture. I haven't bought enough of this product to pull something nice. I did however pull a Tyler Ennis YG out of the 2 boxes I have opened. I also pulled a Haily Wickenhiser insert card. When will your next product review be? I am always excited to see those. i got the deal at dacardworld! it's actually still available at this moment. three blasters for $21.95. as for my next product review... it will be early next month hopefully when spa and anthology come out. i always try to do a review of the products right when they come out. the only one i've missed recently is ultimate memorabilia by itg. can't afford to review that one at the moment!